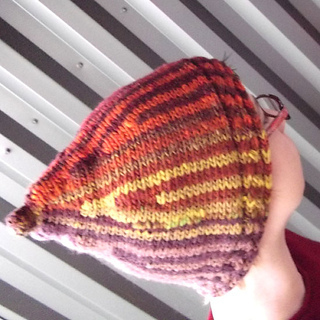 Knit entirely from side to side then grafted, this hat can be knit on straight needles- no circular or double pointed needles necessary! 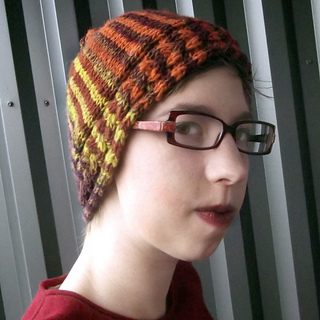 A tight cabled braid around the brim forms a neat edge. Triangle wedges formed by short rows create a pointed tip and gently sloping shape to the top. Use a self-striping yarn like Noro with long repeats in highly contrasting colors for the best results to show off the short row shaping. 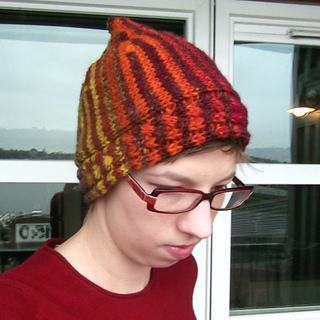 Also available as part of Short Row Hats. 4 stitches and 6 rows per inch in stockinette stitch. Take time to check your gauge.